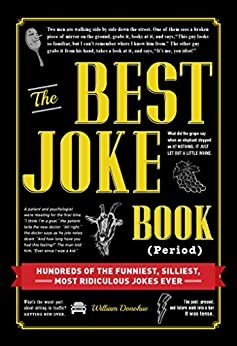 The ultimate collection of the world's greatest funnies, The Best Joke Book (Period) keeps you laughing for hours on end. Inside, you'll find hundreds of jokes that are guaranteed to stir up a room full of smiles, including knock-knocks, witty puns, and one-liners. Complete with hilarious quotes from celebrities like Jon Stewart, Lewis Black, and Jerry Seinfeld, everyone will revel in each gut-busting moment. 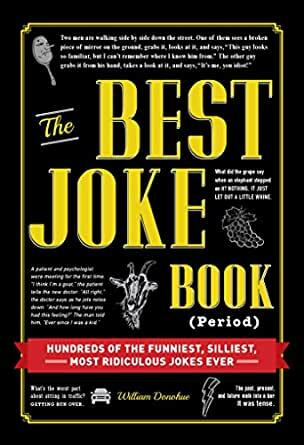 So whether you're looking to add a few jokes to your repertoire, impress your buds, or improve your banter, this sidesplitting book arms you with the perfect joke for any occasion! William Donohue is a writer and standup comedian. He teaches comedy workshops for aspiring comedians and performs weekly at popular venues. Overall a pretty inane joke book, with mostly puns best told and heard in elementary school. See if you find any of the jokes printed on the front cover funny before you consider purchasing it---unless you ARE an elementary student. was not funny. not very many pages to it. 5.0 out of 5 starsWell worth the money! The title pretty well describes it. The range of jokes go from knock-knock jokes to some pretty sophisticated stuff. Well worth the money! Purchased for father-in-law. Haven't given it yet but I thumbed through it myself and I love the way it was written. Funny jokes organized by genre in chapters. Lots of funny quotes by comedians, actors, politicians, etc. Perfect gift for friends or family.